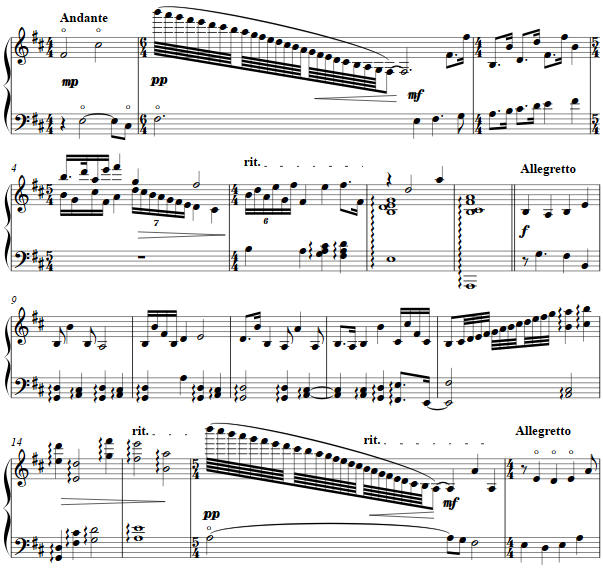 Number 66 of the piano studies, Mikrokosmos, Sz.107, of Béla Bartók provides the theme for this work for harp. A pentatonic melody is shared between right and left hands, titled with the descriptive 'Dallam elosztva', from the second book which was dedicated to Peter Bartók. The melody split between the hands is kept from the piano work, with decoration including written-out ornamentation, glissandi and additional voices, with some phrase lengths modified in "mixed keys" as some scholarly descriptions of the whole write.